Upon finishing checkout, you may select your shipping method. 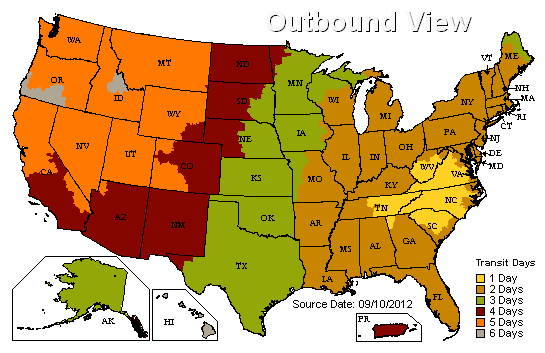 Shipping times on the map below are based on UPS ground estimates. Please remember to consider only business days in transit when calculating your shipping time, this excludes weekends and holidays. We allow at least 24 hours for your order to ship out of our warehouse and most orders will ship on the next business day. Please remember processing time is in addition to the shipping method you choose at check out. Orders placed on weekends and/or holidays should ship the next business day. Weekends and holidays do not count toward transit time. Please review the shipping map carefully; returns will not be accepted for orders placed using the incorrect shipping option. If you have any questions or doubts about the option to choose, please call us at 800-959-4569. Be sure you enter your address correctly when ordering. If delivery is not possible due to an inaccurate address, or apartment/suite number missing we reserve the right to assess $17.50 per box for an address correction. UPS charges $17.50 per box to correct an address regardless of the circumstances, thank you for your understanding. We do not ship to Guam or Puerto Rico. 1) UPS Ground (3-7 Business Days Ground Service): Most orders placed on business days (excluding holidays) will ship within 24 hours and will be delivered within 5 business days (7 calendar days). Please refer to the map (below) showing estimated transit time in your area. Major holidays and weekends do not count toward transit time. Alaska, Hawaii, and Canada can take up to 14-20 business days for arrival, depending the ship method chosen. *Please Note, Next Day Air Saturday Delivery is not available in all areas, as such, this service is only available by phone. Our staff will verify that Saturday Delivery is available in your area prior to processing your order. To qualify for free shipping, you must spend over $99 online (excluding tax where applicable) with a shipping address located within the continental United States (Alaska, Hawaii, & Canada are excluded from this promotion). Some products are exempt from this promotion; please see product description for details. Free shipping offer valid only when using Economy Shipping only. Please see other promotion exemptions below. 1) Only orders placed online qualify for the free shipping promotion, orders placed by phone are exempt. 2) 22” Glow Necklaces are exempt from this promotion when ordering 600+ pieces. 3) Flashing Bubble Guns are exempt from this promotion when ordering 48+ pieces. 4) Closeout items ordered in large quantity may be exempt at our discretion from this promotion, or other discounts. 5) Offer not valid when matching or beating competitor pricing, and cannot be combined with any other offer, or discount. 6) We reserve the right to limit quantities or end this promotion without notice. Sure Glow management reserves all rights with regard to the free shipping promotion. 7) Orders Shipping to Alaska or Hawaii are excluded from the free UPS Ground shipping promotion. If your order is time sensitive please call us so we can help you select he proper shipping method to ensure on-time delivery.